Of the myriad piano concertos composed in the second half of the nineteenth century all but a handful are forgotten. The survivors are played with a regularity that borders on the monotonous—the ubiquitous Tchaikovsky No 1, the Grieg, Saint-Saëns’s Second (in G minor), the two by Brahms and, really, that is just about all there is on offer. Pianists, promoters and record companies play it safe and opt for the familiar. Even a masterpiece can become an unwelcome guest, especially when subjected to an unremarkable outing by yet another indifferent player, as happens so frequently today. How refreshing, then, to have the dust brushed off two forgotten specimens of late nineteenth-century piano concertos and rendered clean and polished for inspection again. Refreshing and rewarding, for both are exactly the sort of pieces that make one wonder why we are forced to live off such a limited concerto diet. How is it that such appealing, well-crafted, imaginative works with their high spirits and luscious tunes could have vanished from the repertoire? Why is it that neither is played as frequently as, say, the Grieg Concerto? Or instead of it? What is it about them that has failed to put them in the classical pop charts? Listening to them afresh it is a teasing question to answer; the longer one ponders the matter the fewer become the justifiable, verifiable reasons why today’s audiences so rarely have the opportunity to enjoy works such as these two delightful crowd-pleasers. It is time for those who promote and play piano music to be more adventurous and imaginative in their programming before this particular corner of the repertoire dies a death from staleness and stultification. 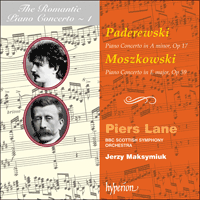 Moszkowski also helped Paderewski in seeing that some of the younger man’s work was published. But there similarities end. As far as their lives and careers went, Moszkowski’s beginning mirrored Paderewski’s end; Padereski’s beginning mirrored Moszkowski’s end. Born in 1854 into a wealthy family, Moritz Moszkowski began music studies at an early age in Dresden, continued at the Stern Conservatory in Berlin and then went on to Theodor Kullak, a pupil of Czerny, at the Neue Akademie der Tonkunst. (Among his fellow students there were the brothers Philip and Xaver Scharwenka who remained friends throughout his life.) He made his debut as a concert pianist in Berlin when he was nineteen and for the next 24 years gave recitals all over Europe, taught at Kullak’s Academy, conducted and composed. When he settled in Paris at the age of 43 he was a famous and well-respected musician. He was also very wealthy for, early on in his career, he had written two pieces of music which were among the most popular piano compositions of the last century. In every piano stool in the land you could find a copy of his Serenade, Op 15 No 1, and the Spanish Dances, Op 12, for piano duet. He and his wife (the sister of Cécile Chaminade) were a popular couple, well-connected and generous in their help of other musicians. Moszkowski, like Grieg and Chopin, was more at home with the piano than anything else, though he achieved some success in London, at least, as a composer of large-scale symphonic works—Joan of Arc, for example (almost certainly an influence on Richard Strauss’s Death and Transfiguration), three Suites for Orchestra, incidental music to Don Juan and Faust, an opera Boabdil (1892) and ballet Laurin (1896). There is also the splendid, romantic Violin Concerto, Op 30—a show-stopper that, curiously, has never found a champion. But of all the melodious and elegant works of Moritz Moszkowski it is his Piano Concerto in E, Op 59, that most strongly begs for revival. It is not a short work and it is not an easy work for the soloist, but its grateful pianistic writing, its memorable themes and its sunny optimism make its present neglect quite incomprehensible. No one could pretend that it is deep music, but if, as one writer put it, ‘it fails to stir the intellect, it sets the pulses tingling’. Were it to be given at a major music festival in place of the usual fare it would bring the house down; given a televised performance, it would re-establish itself as one of the most popular concertos in the repertoire— a status which it enjoyed for many years before the First World War, especially in Germany and the UK (the composer himself was the soloist in its British premiere at a Philharmonic Concert on 12 May 1898). The musical world still looks down its nose at the mention of the name of Moritz Moszkowski. He is all-too-readily pigeon-holed by the derogatory label ‘polished salon music composer’. He was not an original, one is reminded; he added nothing new to musical language; he wrote nothing that others had not written better before him. But are these good enough reasons to ignore the facile, joyous, champagne-brilliance of Moszkowski’s music and help to dissuade all but a handful of imaginative pianists from tackling his entertaining Piano Concerto? Ignacy Jan Paderewski’s Piano Concerto in A minor, Op 17, is chronologically the older of the two works, though written by the younger of the two composers. Paderewski, born in November 1860 in Kurylowka, Podolia (Russian-Poland), was a still virtually unknown 28-year-old when he composed his one Concerto. (His only other large scale work for piano and orchestra is the Fantaisie Polonaise, Op 19, written some five years later.) Though he had made his debut at the tender age of eleven, his career proper as a solo pianist did not take off until his mid-twenties after extensive studies with the great pedagogue Theodor Leschetizky. A spectacular recital in Paris in March 1888 and a further one in Vienna in November the same year were the starting points for a performing career that would make his name synonymous with the piano and lend it near-legendary status during his lifetime. Before his lessons with Leschetizky, his musical life had been a penurious uncertainty for his early dreams of becoming a soloist were wedded to those of becoming a composer. He took courses in composition at the Warsaw Conservatory between 1875 and 1877 while simultaneously touring provincial Russian towns with the Polish violinist Cielewicz. In 1878 he joined the piano faculty in Warsaw, but left four years later to study composition with Friedrich Kiel in Berlin. Here he met Anton Rubinstein who, at that time, occupied the position in the piano world which Liszt had held (and which was to shortly become Paderewski’s). Rubinstein was of the opinion that Paderewski should take his compositional abilites more seriously and the younger man, with characteristic diligence and determination, set about doing just that. He studied orchestration with Heinrich Urban in Berlin and then, financed by the the celebrated Polish actress Modjeska, left for Vienna and his seminal tutelage with Leschetizky. 1888, the year of Paderewski’s Paris and Vienna debuts, was also the year of the composition of the Piano Concerto—the year when the two driving forces of his creative life emerged finally from the wilderness to meet in triumph. His state of mind at the time is etched into every bar of the concerto, revelling in exuberant pianism and fervent emotion. When I finished [the] concerto, I was still lacking in experience. I had not even heard it performed—it was something I was longing for. I wanted to have the opinion then of a really great orchestral composer. I needed it. So without further thought I took my score and went directly to Saint-Saëns. [Saint-Saëns had been unfailingly kind to him on previous occasions, attending his concerts when he had played the French master’s Fourth Piano Concerto.] But I was rather timid … I realised on second thoughts that it was, perhaps, presumption on my part to go to him. Still I went to his house nevertheless. I was so anxious for his opinion. He opened the door himself. ‘Oh, Paderewski, it’s you. Come in,’ he said. ‘Come in. What do you want?’ I realised even before he spoke that he was in a great hurry and irritable, probably writing something as usual and not wanting to be interrupted. ‘What can I do for you? What do you want?’ I hesitated what to answer. I knew he was annoyed. I had come at the wrong moment … ‘I came to ask your opinion about my piano concerto,’ I said very timidly. ‘I ——.’ ‘My dear Paderewski,’ he cried, ‘I have not the time. I cannot talk to you today. I cannot.’ He took a few steps impatiently about the room. ‘Well, you are here so I suppose I must receive you. Let me hear your concerto. Will you play it for me?’ He took the score and read it as I played. He listened very attentively. At the Andante he stopped me, saying, ‘What a delightful Andante! Will you kindly repeat that?’ I repeated it. I began to feel encouraged. He was interested. Finally he said, ‘There is nothing to be changed. You may play it whenever you like. It will please the people. It’s quite ready. You needn’t be afraid of it, I assure you.’ So the interview turned out very happily after all, and he sent me off with high hopes and renewed courage. At that moment in my career, his assurance that the concerto was ready made me feel a certain faith in my work that I might not have had then. Thanks to the influence of Leschetizky, to whom Paderewski dedicated the work, the first performance was conducted by no less than Hans Richter, possibly the most influential European conductor of the day, and had ‘an immediate success’. Seuls quelques-uns des innombrables concertos pour piano composés au cours de la seconde moitié du dix-neuvième siècle ont échappé à l’oubli, et sont joués avec une regularité qui frise la monotonie: l’omniprésent Concerto no l de Tchaïkovski, le Grieg, le Deuxième de Saint-Saëns (en sol mineur), les deux de Brahms, et c’est à peu près tout. Pianistes, organisateurs de concerts et maisons de disques ne prennent aucun risque et optent pour les œuvres familières. Même un chef-d’oeuvre peut devenir ennuyeux, surtout aux mains d’un interprète médiocre de plus, comme c’est souvent le cas aujourd’hui. Cela fait donc plaisir de voir deux spécimens oubliés des concertos pour piano de la fin du dix-neuvième siècle déterrés et apprêtés pour un nouvel examen. Et le plaisir vaut la peine, car tous deux sont exactement le genre de pièces qui nous font nous demander pourquoi nous sommes astreints à un régime de concertos aussi limité. Comment se fait-il que des œuvres aussi plaisantes, délicatement ouvrées et pleines d’imagination, d’entrain et de voluptueuses mélodies aient disparu du répertoire? Pourquoi ni l’un ni l’autre n’est-il joué aussi souvent que le Concerto de Grieg par exemple? Ou à sa place? Qu’y a-t-il en eux qui les empêche de figurer au hit-parade classique? Difficile à dire en les écoutant à nouveau plus on y réfléchit, moins on trouve de raisons justifiées et vérifiables au fait que le public d’aujourd’hui a si rarement l’occasion de goûter des œuvres aussi charmeuses que ces deux ravissants concertos. Il est grand temps qu’organisateurs et interprètes fassent preuve de plus d’audace et d’imagination dans leur choix de programme, avant que ce coin particulier du répertoire ne meure d’usure et de ridicule. «Après Chopin», écrivit Paderewski, «Moritz Moszkowski est celui qui sait le mieux écrire pour le piano, et son écriture englobe toute la gamme de la technique pianistique.» Les deux pianistes-compositeurs avaient en commun d’autres points que leur art. Tous deux étaient polonais (bien que Moszkowski soit né à Breslau, capitale de la Silésie alors allemande). Tous deux étaient cultivés et spirituels. Le plus célèbre trait d’esprit de Moszkowski l’immortalisa: à la pompeuse déclaration de Hans von Bulow, «Bach, Beethoven, Brahms: tous les autres sont des crétins», Moszkowski riposta: «Mendelssohn, Meyerbeer et votre humble serviteur Moritz Moszkowski: tous les autres sont des chrétiens!» La plus célèbre repartie de Paderewski, bien que probablement apocryphe, reposait d’ailleurs aussi sur un jeu de mots (en anglais). Une riche hôtesse américaine l’ayant prit pour un célèbre joueur de polo, Paderewski aurait répondu: «No, he is a rich soul who plays polo; I am a poor Pole who plays solo» («Non, c’est un riche individu qui joue au polo; moi je suis un pauvre Polonais qui joue en solo»). Moszkowski aida d’autre part Paderewski en arrangeant la publication de plusieurs des œuvres de son jeune collègue. Mais la s’arrête la ressemblance. Pour ce qui est de leurs vies et de leurs carrières, les débuts de Moszkowski rappellent la fin de Paderewski, et réciproquement. Né en 1854 dans une famille aisée, Moritz Moszkowski commença très jeune ses études de musique à Dresde, les poursuivit au Conservatoire Stern de Berlin puis auprès de Theodor Kullak, un élève de Czerny, à la Neue Akademie der Tonkust. (Parmi ses camarades d’études se trouvaient les frères Philip et Xaver Scharwenka qui furent toute sa vie ses amis.) Il fit ses débuts de pianiste à Berlin à l’âge de dix-neuf ans, et au cours des vingt-quatre années qui suivirent il donna des récitals dans toute l’Europe, enseigna à l’Académie de Kullak, dirigea et composa. Quand il s’installa à Paris à l’âge de quarante-trois ans, c’était un musicien célèbre et respecté. Il était aussi très riche car il avait au début de sa carrière écrit deux pièces qui figurèrent parmi les compositions pour piano les plus populaires du siècle dernier. On trouvait dans tous les salons de musique un exemplaire de sa Sérénade, op. 15 no l, et de ses Danses espagnoles, op. 12, pour piano à quatre mains. Lui et sa femme (la sœur de Cécile Chaminade) étaient un couple populaire, avec de nombreuses relations, et aidaient généreusement les autres musiciens. Comme pour Grieg et Chopin, le piano était l’instrument de prédilection de Moszkowski, bien qu’il ait eu quelque succès, à Londres du moins, comme compositeur de grandes œuvres orchestrales, entre autres Jeanne d’Arc (qui influença presque certainement Mort et Transfiguration de Richard Strauss), trois Suites pour orchestre, la musique de scène de Don Juan et Faust, un opéra, Boabdil (1892) et un ballet, Laurin (1896). Il y a aussi le très romantique Concerto pour violon, op. 30, œuvre splendide qui, chose curieuse, n’a jamais trouvé de champion. Mais de toutes les œuvres élégantes et mélodieuses de Moritz Moszkowski c’est surtout son Concerto pour piano en mi, op. 59, qui mérite d’être rejoué. Ce n’est pas une œuvre courte, ni une œuvre facile pour le soliste, mais son écriture pianistique agréable, ses thèmes mémorables et son optimisme radieux rendent tout à fait incompréhensible l’oubli dans lequel il est tombé. On ne saurait prétendre qu’il s’agit là d’une musique profonde, mais comme on l’écrivit à son sujet, «si elle n’excite pas l’intellect, elle fait battre le coeur.» Si on donnait ce concerto lors d’un grand festival de musique à la place du programme habituel, il serait applaudi à tout rompre, si l’exécution en était télévisée, il serait réhabilité comme l’un des concertos les plus populaires du répertoire— position dont il jouit pendant de longues années avant la première guerre mondiale, en particulier en Allemagne et en Grande-Bretagne (le soliste était le compositeur en personne lors de sa création britannique au Concert Philharmonique du 12 mai 1898). Le monde musical considère encore Moritz Moszkowski avec dédain. On l’étiquette trop facilement comme compositeur accompli de musique de salon. On nous rappelle que ce n’était pas un original: il n’a rien apportée de neuf au langage musical, n’a rien écrit que d’autres n’aient mieux écrit avant lui. Mais est-ce une raison suffisante pour se désintéresser du pétillement facile et joyeux de la musique de Moszkowski, et pour dissuader tous les pianistes, sauf quelques-uns avec assez d’imagination, de s’attaquer à son divertissant Concerto pour piano? Le Concerto pour piano en la mineur, op. 17, d’Ignacy Jan Paderewski est chronologiquement la plus ancienne des deux œuvres, bien qu’écrite par le plus jeune des deux compositeurs. Paderewski, né en novembre 1860 à Kurylowka en Podolie (Pologne russe) était encore pratiquement inconnu quand il composa son seul concerto à l’âge de vingt-huit ans. (Sa seule autre œuvre à grande échelle pour piano et orchestre est la Fantaisie Polonaise, op. 19, écrite quelque cinq ans plus tard.) Bien qu’il ait fait ses débuts dès l’âge de onze ans, sa carrière de pianiste proprement dite ne prit son essor qu’à partir de vingt-cinq ans environ, après des études approfondies auprès du grand pédagogue Theodor Leschetizky. Un récital spectaculaire à Paris en mars 1888, et un autre à Vienne en novembre de la même année, marquèrent le début de la carrière d’un interprète dont le nom allait devenir synonyme de piano, et qui allait devenir une légende de son vivant. Avant ses leçons avec Leschetizky, sa vie musicale avait été marquée par une incertitude stérile, car à ses premiers rêves de devenir soliste s’ajoutait celui de devenir compositeur. Il prit des cours de composition au Conservatoire de Varsovie de 1875 à 1877, tout en faisant des tournées dans les villes de province russes avec le violoniste polonais Cielewicz. Dès 1878 il enseigna le piano à Varsovie, mais quitta ce poste quatre ans plus tard pour étudier la composition avec Friedrich Kiel à Berlin. Il y rencontra Anton Rubinstein, qui à cette époque occupait dans le monde pianistique la place qu’avait tenue Liszt (et qui allait bientôt devenir celle de Paderewski). Rubinstein conseilla à Paderewski de prendre plus au sérieux ses talents de compositeur, et c’est ce à quoi s’appliqua le jeune homme, avec une diligence et une détermination caractéristiques. Il étudia l’orchestration avec Heinrich Urban à Berlin puis, grâce à l’aide financière de la célèbre actrice polonaise Modjeska, partit pour Vienne et l’influente tutelle de Leschetizky. 1888, l’année des débuts parisiens et viennois de Paderewski, fut aussi l’année de la composition du Concerto pour piano, celle où les deux moteurs de sa vie créatrice émergèrent finalement au grand jour pour se conjuguer triomphalement. Son état d’esprit de l’époque est gravé dans chaque mesure du concerto, qui dégage un pianisme exubérant et une émotion fervente. Quand je terminai le concerto, je manquai encore d’expérience. Je ne l’avais même pas entendu exécuter—c’était quelque chose que j’attendais avec impatience. Je voulus alors connaître l’opinion d’un vraiment grand compositeur de musique orchestrale. Cela m’était indispensable. Sans réfléchir davantage, je pris donc ma partition et me rendis directement chez Saint-Saëns. [Saint-Saëns avait été d’une grande bonté pour lui à plusieurs occasions, et avait assisté aux concerts où Paderewski avait joué le Quatrième concerto pour piano du maître français.] Mais j’étais assez timide … Je réalisai après mûre réflexion qu’il était peut-être présomptueux de ma part d’aller le voir. J’y allais malgré tout. Je désirais tellement avoir son avis. Il ouvrit lui-même la porte. «Ah, Paderewski, c’est vous. Entrez, entrez» dit-il. «Que voulez-vous?» Je réalisai avant même qu’il ne parle qu’il était pressé et irritable, parce qu’il était probablement comme d’habitude en train d’écrire quelque chose et ne voulait pas être interrompu. «Que puis-je faire pour vous? Que voulez-vous? J’hésitai. Je savais qu’il était contrarié. J’étais venu au mauvais moment … «Je suis venu vous demander votre avis sur mon concerto pour piano», ais-je très timidement, «je …» «Mon cher Paderewski», s’écria-t-il, «je n’ai pas le temps. Je ne peux absolument pas discuter avec vous aujourd’hui.» Il fit impatiemment quelques pas dans la pièce. «Enfin, puisque vous êtes là, je suppose que je ferais aussi bien de vous recevoir. Voyons ce concerto. Pouvez-vous me le jouer?» Il prit la partition et la lut pendant que je jouais. Il écouta très attentivement. A l’Andante il m’interrompit en disant: «Quel ravissant Andante! Pouvez-vous le reprendre?» Je le rejouai. Je commençais à me sentir encouragé. Il montrait de l’intérêt. A la fin il déclara: «Il n’y a rien à y changer. Vous pouvez le jouer quand vous voulez. Il plaira. Il est tout à fait prêt, n’ayez crainte, je vous assure.» L’entrevue s’avéra donc favorable finalement, et je le quittai plein d’espoir et avec un courage redoublé. A ce moment de ma carrière, son assurance que le concerto était prêt me donna une foi dans mon œuvre que je n’aurais pas eu autrement. Paderewski souhaitait créer l’œuvre lui-même, mais Madame Essipoff (formidable pianiste, et la femme de Leschetizky à cette époque) déclara que «comme elle avait déjà présenté plusieurs de ses compositions à Vienne, elle aimerait faire aussi ce concerto.» Elle y travaillait depuis plusieurs semaines. Paderewski accéda à sa requête avec quelque réticence, mais il fut après tout «heureux qu’elle le fit, parce que je n’avais pas suffisamment étudié le concerto pour le jouer dans un grand concert.» Grâce à l’influence de Leschetizky, auquel Paderewski avait dédié son œuvre, la première exécution fut dirigée par Hans Richter en personne, qui était sans doute à l’époque le chef d’orchestre européen le plus influent, et eut «un succès immédiat». Von den unzähligen klavierkonzerten, die in der zweiten Hälfte des 19. Jahrhunderts komponiert wurden, sind bis auf eine Handvoll alle vergessen. Die bekannten werden mit einer Regelmäßigkeit gespielt, die an Eintönigkeit grenzt—Tschaikowskis allgegenwärtige Nr. 1, das Konzert von Grieg, Saint-Saëns’ 2. Konzert (in g-Moll), die beiden von Brahms, mehr wird eigentlich kaum geboten. Pianisten, Konzertveranstalter und Plattenfirmen gehen auf Nummer Sicher und entscheiden sich für das Bekannte. Sogar ein Meisterwerk kann zum unwillkommenen Gast werden, wenn es wieder einmal von einem mittelmäßigen Interpreten eine wenig bemerkenswerte Darbietung erfährt, wie es heutzutage so oft geschieht. Wie erfrischend ist es da, zwei vergessene Klavierkonzerte des späten 19. Jahrhunderts entstaubt und zur allgemeinen Begutachtung aufpoliert zu sehen. Erfrischend und lohnend, denn beide gehören zu jener Sorte von Werken, die Verwunderung aufkommen läßt, daß wir gezwungen sind, uns in Bezug auf Klavierkonzerte mit einer solch eingeschränkten Kost zu bescheiden. Wie kommt es, daß derart ansprechende, wohlkonstruierte, phantasievolle Werke mit gehobener Stimmung und üppigen Melodien aus dem Repertoire verschwinden konnten? Warum wird keines von beiden so häufig gespielt wie, sagen wir, das Grieg-Konzert? Oder gar statt seiner? Was haben sie an sich, das ihr Vordringen in die Klassik-Hitparaden verhindert? Wer sie sich unvoreingenommen anhört, wird es schwer haben, diese Fragen zu beantworten. Je länger man darüber nachdenkt, desto weniger stichhaltige, nachprüfbare Gründe fallen einem dafür ein, daß das heutige Publikum so selten Gelegenheit erhält, sich an Werken wie diesen zwei entzückenden, eingängigen Stücken zu erfreuen. Es wird höchste Zeit, daß diejenigen, die Klaviermusik fördern und spielen, in ihrer Programmgestaltung etwas abenteuerlustiger und phantasievoller werden, ehe dieser spezielle Bereich des Repertoires an Abgedroschenheit und Verdummung eingeht. „Neben Chopin versteht es Moritz Moszkowski am besten, für das Klavier zu komponieren“, schrieb Paderewski, „und seine Kompositionen erfassen die gesamte Bandbreite der Klaviertechnik.“ Diese beiden Pianisten und Komponisten hatten mehr gemeinsam als nur ihre Kunst. Sie waren Polen (auch wenn Moszkowski in Breslau, der damaligen schlesischen Hauptstadt, geboren wurde). Und sie waren geistreiche, gebildete Männer. Moszkowskis berühmtestes Bonmot hat ihn unsterblich gemacht—eine schlagfertige Erwiderung auf Hans von Bülows wichtigtuerische Erklärung „Bach, Beethoven, Brahms: Tous les autres sont des crétins“ („Alle anderen sind Idioten“), auf die Moszkowski mit den Worten reagierte: „Mendelssohn, Meyerbeer und ihr ergebener Diener Moritz Moszkowski: Tous les autres sont des chrétiens!“ („Alle anderen sind Christen!“). Übrigens beinhaltet Paderewskis bekanntester, wenn auch möglicherweise apokrypher Ausspruch ebenfalls ein Wortspiel. Als er von einer betuchten amerikanischen Gastgeberin mit einem berühmten Polospieler verwechselt wurde, soll er geantwortet haben: „No, he is a rich soul who plays polo—I am a poor Pole who plays solo“ („Er ist eine gar nicht arme Seele, die Polo spielt—ich dagegen bin ein armer Pole, der solo spielt“). Moszkowski war Paderewski auch insofern behilflich, als er dafür sorgte, daß ein Teil der Werke des jüngeren Mannes veröffentlicht wurde. Da jedoch enden die Ähnlichkeiten. Was ihr Leben und ihre Karriere angeht, entsprach Moszkowskis Anfang Paderewskis Ende; und Paderewskis Anfang entsprach Moszkowskis Ende. 1854 als Sohn einer begüterten Familie geboren, begann Moritz Moszkowski frühzeitig, in Dresden Musikunterricht zu nehmen. Er setzte seine Studien am Sternschen Konservatorium in Berlin fort und wechselte dann zu Theodor Kullak, einem Schüler von Czerny, an die Neue Akademie der Tonkunst über. (Zu seinen Kommilitonen zählten dort die Brüder Philipp und Xaver Scharwenka, die zeitlebens mit ihm befreundet blieben.) Er absolvierte mit 19 Jahren in Berlin sein Debüt als Konzertpianist und gab in den nächsten 24 Jahren in ganz Europa Konzerte, lehrte an Kullaks Akademie, dirigierte und komponierte. Als er sich mit 43 Jahren in Paris niederließ war er ein berühmter, allgemein respektierter Künstler. Obendrein war er wohlhabend, denn er hatte zu Beginn seiner Karriere zwei Musikstücke geschrieben, die zu den populärsten Klavierkompositionen des letzten Jahrhunderts gehörten. In jeder aufklappbaren Klavierbank weit und breit war ein Exemplar seiner Serenade Op. 15 Nr. 1 und der spanischen Tänze Op. 12 für Klavier zu vier Händen zu finden. Er und seine Frau (die Schwester von Cécile Chaminade) waren ein beliebtes Paar mit ausgezeichneten Verbindungen, und großzügig, wenn es darum ging, anderen Musikern zu helfen. Moszkowski fühlte sich, ebenso wie Grieg und Chopin, am ehesten mit Klavierkompositionen heimisch, obwohl er zumindest in London einigen Erfolg als Komponist großangelegter sinfonischer Werke erlangte—mit Jeanne d’Arc zum Beispiel (das höchstwahrscheinlich Richard Strauss’ Tod und Verklärung beeinflußt hat); dazu kamen drei Orchestersuiten, Bühnenmusik zu Don Juan und Faust, eine Oper mit dem Titel Boabdil (1892) und ein Ballett, Laurin (1896). Außerdem liegt sein herrliches romantisches Violinkonzert Op. 30 vor—ein Bravourstück, das seltsamerweise nie einen Fürsprecher gefunden hat. Die Musikwelt rümpft nach wie vor die Nase, wenn der Name Moritz Moszkowski fällt. Er läßt sich allzu leicht mit dem abfälligen Etikett eines „glatten Salonmusikkomponisten“ belegen; er hat dem musikalischen Vokabular nichts Neues hinzugefügt; er hat nichts geschrieben, das nicht andere zuvor und besser geschrieben haben. Aber sind diese Gründe gut genug, um die flüssige, freudige, überschäumende Brillanz von Moszkowskis Musik zu ignorieren und bis auf einige wenige originelle Pianisten alle davon abzubringen, sein unterhaltsames Klavierkonzert einzustudieren? Ignacy Jan Paderewskis Klavierkonzert in a-Moll Op. 17 ist chronologisch das ältere der zwei Werke, obwohl es vom jüngeren der beiden Komponisten geschrieben wurde. Paderewski, im November 1860 in Kurylówka im russisch-polnischen Gouvernement Podolien geboren, war ein noch fast ganz unbekannter 28jähriger, als er sein einziges Konzert komponierte. (Sein anderes großangelegtes Werk für Klavier und Orchester ist die annähernd fünf Jahre später entstandene Polnische Fantasie, Op. 19.) Obwohl er im zarten Alter von 11 Jahren sein Debüt gegeben hatte, begann seine eigentliche Solokarriere als Pianist erst, als er Mitte zwanzig war, nach ausführlichem Studium bei dem großen Padagogen Theodor Leschetizky. Ein spektakuläres Konzert in Paris im März 1888 und ein weiteres in Wien im November des Jahres waren Anfangspunkte einer Laufbahn als Interpret, die dazu führen sollte, daß sein Name als Synonym für Klavier galt und zu seinen Lebzeiten nahezu legendär war. Bevor er bei Leschetizky Unterricht nahm, war sein musikalisches Schaffen von Unsicherheit geprägt, denn seine frühen Träume von einer solistischen Karriere waren eng verknüpft mit dem Wunsch, Komponist zu werden. Er besuchte zwischen 1875 und 1877 am Warschauer Konservatorium Seminare in Kompositionslehre und ging gleichzeitig mit dem polnischen Violinisten Cielewicz auf Tournee durch russische Provinzstädte. 1878 trat er in Warschau in die Klavierfakultät ein, verließ sie jedoch vier Jahre später wieder, um bei Friedrich Kiel in Berlin Komposition zu studieren. Dort lernte er Anton Rubinstein kennen, der damals in der Welt des Klaviers den Rang einnahm, den zuvor Liszt innegehabt hatte (und der bald darauf Paderewski gehören sollte). Rubinstein äußerte die Ansicht, daß Paderewski sein Kompositionstalent ernster nehmen solle, und der jüngere Mann machte sich mit typischer Sorgfalt und Zielstrebigkeit sogleich daran, den Ratschlag umzusetzen. Er nahm bei Heinrich Urban in Berlin Unterricht im Orchestrieren und reiste dann mit finanzieller Unterstützung der gefeierten polnischen Schauspielerin Modjeska ab nach Wien zum folgenreichen Studium bei Leschetizky. 1888, das Jahr von Paderewskis Pariser und Wiener Debüt, war außerdem das Jahr, in dem er das Klavierkonzert komponierte—das Jahr, in dem die zwei Triebkräfte seines kreativen Lebens endlich zusammenkamen, um im Triumph miteinander verschmolzen zu werden. Sein Gemütszustand um diese Zeit macht sich bemerkbar in jedem einzelnen Takt des Konzerts, das in überschäumender Pianistik und feuriger Emotion schwelgt. Als ich das Konzert vollendete, mangelte es mir noch an Erfahrung. Ich hatte noch keine Aufführung gehört—es entsprach meinen Sehnsüchten. Ich wünschte mir damals, als wahrhaft bedeutender Orchesterkomponist zu gelten. Ich brauchte das. Darum nahm ich ohne einen weiteren Gedanken meine Partitur und ging damit direkt zu Saint-Saëns. [Saint-Saëns hatte sich bei früherer Gelegenheit ihm gegenüber immer freundlich verhalten und war zu seinen Konzerten erschienen, als Paderewski das 4. Klavierkonzert des französischen Meisters spielte.] Aber ich war recht ängstlich … Ich erkannte nach reiflicher Überlegung, daß es wohl anmaßend von mir war, zu ihm zu gehen. Aber ich begab mich dennoch zu seinem Haus. Ich wollte unbedingt seine Meinung hören. Er kam persönlich an die Tür. „Oh, Paderewski, Sie sind es. Kommen Sie herein“, sagte er. „Kommen Sie herein. Was wollen Sie?“ Noch ehe er ein Wort gesprochen hatte, war mir klar, daß er in großer Eile und gereizter Stimmung war, daß er wohl wie üblich dabei war, etwas zu schreiben, und nicht gestört werden wollte. „Was kann ich für Sie tun? Was wollen Sie?“ Ich zögerte mit meiner Antwort. Ich wußte, er war verärgert. Ich war im falschen Augenblick gekommen … „Ich wollte Ihre Meinung über mein Klavierkonzert erfragen“, sagte ich völlig verschüchtert. „Ich——“ „Mein lieber Paderewski“, rief er, „ich habe keine Zeit. Ich kann mich heute nicht mit Ihnen unterhalten. Ich kann nicht.“ Er ging ungeduldig einige Schritte im Zimmer auf und ab. „Nun, da Sie schon einmal hier sind, muß ich Sie wohl empfangen. Lassen Sie mich Ihr Konzert hören. Wollen Sie es mir vorspielen?“ Er nahm die Partitur und las mit, während ich spielte. Er hörte sehr aufmerksam zu. Beim Andante unterbrach er mich und sagte: „Was für ein reizendes Andante! Wollen Sie so freundlich sein, es zu wiederholen?“ Ich wiederholte es. Ich begann mich ermutigt zu fühlen. Er war interessiert. Schließlich sagte er: „Da gibt es nichts zu ändern. Sie können es spielen, wann immer Sie wollen. Es wird den Leuten gefallen. Es ist durchaus aufführungsreif. Sie brauchen keine Angst zu haben, ich versichere es Ihnen.“ So nahm die Begegnung doch noch einen glücklichen Ausgang, und er entließ mich hoffnungsfroh und mit gestärktem Mut. In diesem Augenblick meines Werdegangs gab mir seine Zusicherung, das Konzert sei aufführungsreif, ein gewisses Zutrauen in mein Werk, dessen ich damals nicht ohne weiteres fähig gewesen wäre. Paderewski hätte die Premiere des Werks am liebsten selbst gespielt, doch Madame Essipoff (eine hervorragende Pianistin und zum damaligen Zeitpunkt Leschetizkys Gemahlin) sagte, „da sie schon einige Kompositionen von ihm (Paderewski) in Wien eingeführt habe, wolle sie auch dieses Konzert geben.“ Sie hatte sich bereits wochenlang damit befaßt. Paderewski entsprach eher widerstrebend ihrer Bitte, war aber dann doch „froh, es ihr zu überlassen, denn ich hatte das Konzert nicht ausreichend eingeübt für eine gelungene öffentliche Aufführung.“ Es ist dem Einfluß Leschetizkys zu verdanken, dem Paderewski das Werk gewidmet hat, daß die Uraufführung von keinem Geringeren als Hans Richter dirigiert wurde. Richter war zu jener Zeit der wahrscheinlich einflußreichste europäische Dirigent, und das Werk hatte „unmittelbaren Erfolg“. Um die Worte von Sir Thomas Beecham umzumünzen (der übrigens von Moszkowski im Orchestrieren unterrichtet wurde): Diese beiden Konzerte haben „ein Raffinement und eine Kultiviertheit, die es nie versäumt, dem Ohr angenehm aufzufallen, und bieten dem musikalischen Amateur, der manchmal das Gefühl haben könnte, daß seine Kunst sich ein wenig zu weit fortentwickelt, um von ihm noch verstanden oder genossen zu werden, lindernde Zuflucht, in deren Schutz er neuen Mut schöpfen kann“.